A Qt 3D QML application that illustrates how to render a scene in Qt 3D with shadows. 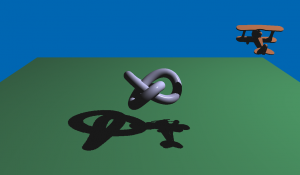 Qt 3D Shadow Map illustrates how to configure the renderer in order to accommodate custom rendering techniques. The example application displays a self-shadowed plane and trefoil knot. We implement shadow mapping using a two pass rendering. In the first pass, we generate the shadow information. In the second pass, we generate the scene using the forward rendering technique with Phong shading, while at the same time using the information gathered in the first pass to draw the shadows. The entire rendering is configured using QML, but it is possible to use C++ to achieve the very same result. We set up the entire scene in the main.qml file. We specify the Light custom entity in ShadowMapLight.qml. In Qt 3D, the frame graph is the data-driven configuration for the rendering. We implement the frame graph in the ShadowMapFrameGraph.qml file. Any path from the leaves of this tree to the root is a viable frame graph configuration. Filter entities can enable or disable such paths, and selector entities can alter the configuration. The actual passes are not defined within the frame graph. Instead the available passes are declared in the Materials used in the scene graph. The frame graph is only used to select which passes are used when rendering. In the shadow map generation pass, we must render to an offscreen surface (Framebuffer Object) which has a depth texture attachment. In Qt 3D, it is represented by the RenderTarget entity, which has a number of attachments. The bulk of the magic happens in the AdsEffect.qml file, where our main Effect is defined. It implements the Ambient, Diffuse and Specular (ADS) Lighting Model using Phong shading with the addition of shadow mapping. It is possible to put such parameters all the way down, from a Material, to its Effect, to one of the effect’s Techniques and a RenderPass within a Technique. This allows a Material instance to override defaults in an Effect, Technique or RenderPass. The second pass is a normal forward rendering using Phong shading. The code in the effect entity is extremely simple. We simply configure some parameters and load a pair of shaders which will be used when drawing. Actually, the coordinates get adjusted a little to allow us to easily sample the shadow map texture.